Momma Told Me: If you keep listening to that so loud, you'll go deaf! I still recall my very first Walkman cassette player. It had the most impractical, and uncomfortable, wire framed headphones with hideous orange earpads. And, because the purpose of the Walkman was to be portable, it ironically failed on it's execution of portable sound. Sure, I could crank the volume all the way up to drown out the rumble of our family's mini van, or the chatter on the bus- but that also meant everyone around me was forced to listen as well. Then, with my first compact CD player, in the 90s, came a new DJ inspired headset. Now that the advances in portable audio had vastly improved the quality of output, consumers sought a more intimate and all consuming experience. In some cases larger than the actual CD player device, audiophiles everywhere strapped on highly padded 'noise cancelling' headsets. Not only were these headsets quite heavy, but extremely uncomfortable for any period of time. That seemed to bother me least, in exchange for listening to my favorite tunes, on loop, as I'd find creative ways to strap and hang them with the least discomfort. It goes without saying that technological advancements in my lifetime, thus far, have been nothing short of astounding. That which was only intended for professional precision just a decade back is now sold in increasingly smaller devices, at lower costs to consumers worldwide. And, as media conversion and transport has evolved from bulky vinyl discs to intangible digital formats, the methods through which we consume this entertainment has progressed as well. One such pioneer in the audio industry is famed research and technical company Etymotic. With an engineering approach to research and a namesake that literally means 'true to the ear', Etymotic was founded by a Phd in 1983 to accurately asses the audio limits of the human ear. What better, accidental, development for precision audio technology than through the meticulous research and understanding of the human ear? Dr Killion's advancements for the medically deaf and hearing impaired broke barriers of previous audio conceptions, and in turn enhanced the listening experience of music lovers worldwide. Based on the same principles of targeted audio delivery as many current hearing aids, in 1984, Etymotic developed and marketed their first pair of precision insert earphones. 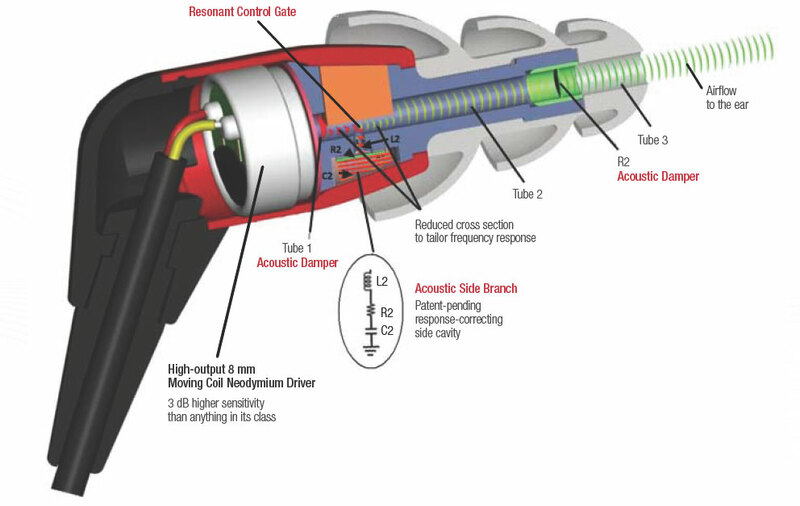 Their introduction of balanced armature receivers, the customization of audio delivery to meet the individual target, was revolutionary in the non-medical audio world. Then, in 1991, Etymotic devised the world's first Noise Isolating High Fidelity In-Ear Earphone; the basis for nearly all subsequent in ear monitors and recording devices since. If all of this technical jargon is confusing you it boils down to this; Etymotic is one of the industry's leaders in audio delivery advancement, with product development based on proven studies and even medical information. Not only do their consumer based headsets demand the highest quality of audio output, but the safest delivery, for increased listening and enjoyment. I'll admit, it's often hard for me to consider coughing up more than $75 for a good pair of ear buds. They get lost so easily, and the cords tend to pinch or break in storage and wrapping- rendering them useless. But I was not surprised to learn that high end personal audio output can easily dip into the multi-hundreds, and often exceed $250. for those passionate about their music, and in tune to the infinite acoustics of high fidelity sound, a pair of Skull Candies simply will not do. My other half is one who falls into this category, turning his nose up at even some of the high end contenders, rambling on about finities I'd never pick up on. 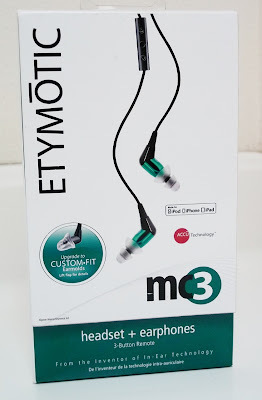 As a sensible woman, with Momma's words ringing in her ear, my attraction to Etymotic's low-cost (under $100) mc3's was the 2 year limited warranty and ear healthy noise delivery. At the core of Etymotic's personal audio technology is the simple concept of targeted audio delivery. 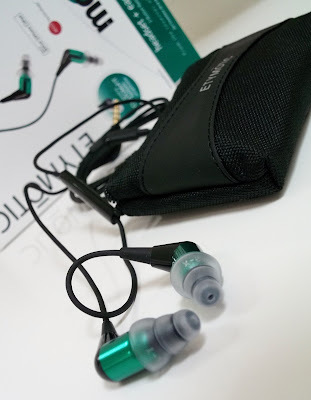 Rather than drowning out the world around us with a harsh barrage of audio waves, Etymotic has harnessed the finite frequencies of audio and delivered them directly, in ear. Small sound with big impact, on a personal level. 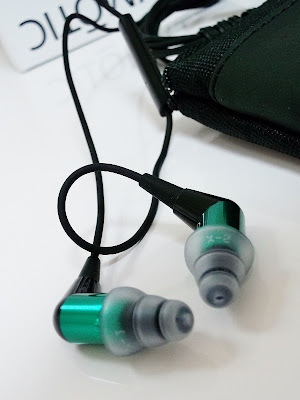 We received a pair of Etymotic's mc3 (youth targeted and economy model, SRV $99) In Ear Headset and Earphones for review here on Momma Told Me. I quickly picked up on the quality standards that the brand evidently held throughout their collection. 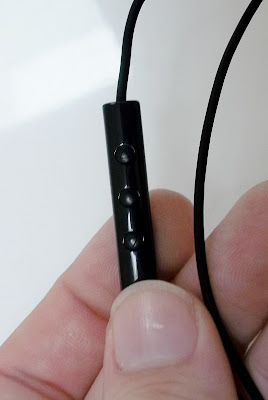 These headphones were packaged with the same educational presentation, safe storage pouch, and varied earbud caps as any other model. They were certainly the oddest looking 'in ear' bud I'd ever seen, with their tri cone tips. Compatible with nearly all modern personal audio output devices (iPAd, iPhone, MP3, etc) the mc3's include access to a very unique APP which enables the user to modify the level of noise isolation when listening. This is a big plus for safety, as many rely on audio enjoyment while performing potentially dangerous tasks such as biking near open traffic, or driving. The AWARENESS Programmable Noise Isolation APP enables the user to alter the intensity of audio output, without compromising quality, to foster a dual awareness of the surrounding environment. This alone is a great selling point for parents of teen music fans! 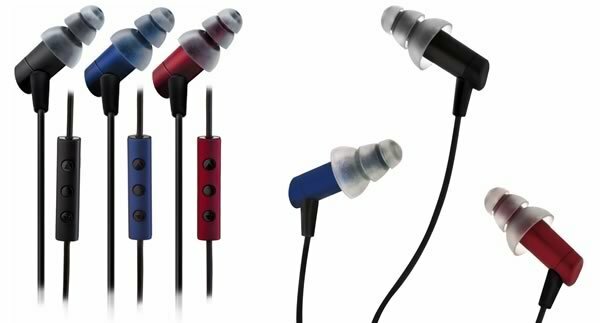 Some additional bragging points of the mc3 include a highly sturdy Kevlar reinforced cable, close proximity high sensitivity microphone (for hands free communication), and the additional options for in ear tips and comfort. Speaking of those tips... I'll admit, the layered cone adapters reminded me of some sci-fi technology at first. 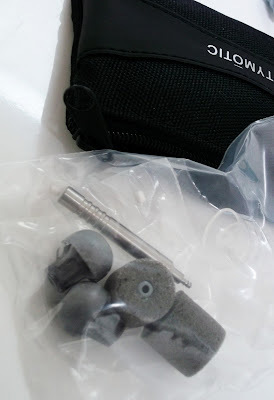 Oddly enough, these were the ones I found most comfortable, with a very soothing 'umbrella' effect that efficiently distributes sound and isolates outside noise during use. The ultra soft material molds to one's ear canal without scratching or irritating in long term use. And, because the sound is being delivered in such close proximity to the ear drum, and at such highly attune frequencies, the output is much safer and natural to our hearing. I hardly profess to be an audio snob, but even I could clearly tell the difference in depth and clarity compared to my old $30 earbuds. In fact, I was astounded the way new instrumentals and faint backtracks came to life. It was as though I were discovering my favorite songs for the first time again! 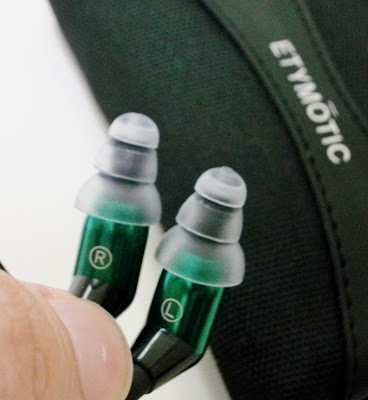 UPDATE: I recently had a chance to further investigate the Etymotic brand, when I was sent their Best In Class (under $200) hf3 Noise Isolating Headset + Microphone. While almost identical to the previously reviewed hf3's in appearance, there is a notable difference in specialized performance. Featuring high performance balanced armature ACCU Drivers, the hf3 system offers 35-45 dB of noise isolation and an advanced 105 dB sensitivity rating, with built in microphone. This means I can efficiently use my hf3's for audio consumption and digital communication through my iPad and iPhone devices. Unfortunately, with 4' of cord to tether the user, Etymotic's technology is a bit of a compromise between convenience and precision function. many users will find this a more than fair exchange, however, when paired with the brand's one of a kind AWARENESS! Mobile App, which allows users to adjust the audio output to filter various background or external noises for safety and practicality- without compromising the output audio's integrity. 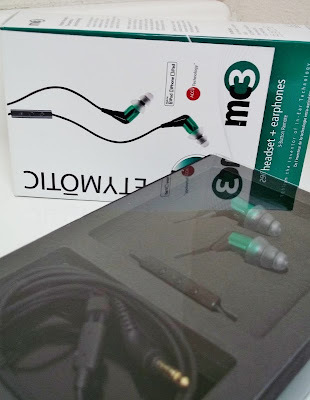 While the numbers, on paper, may not seem like they hold a wide enough gap to justify the leap in cost from the mc3's to the hf3's, these high fidelity earphones hold the documented highest noise isolation of any on the market today. Including a generous 2 year warranty, and kevlar reinforced cable, the hf3's unique ACCU filter features the brand's one of a kind exchangeable sheild, which protect the armature from ear wax, and maintain optimal performance. To my, untrained, ears, the side by side comparison of mc3 to hf3 is still tangible. Audio quality has more depth, and noise isolation is impressively specialized. Some of the more finite background noises (fans in the next room over, birds chirping, etc) can be ultimately eliminated, versus muffled. On the alternate end, I can clearly discern multiple levels of sound output (bass, vocals, treble, etc), while altering the filters to permit external audio. This is particularly useful when jogging, waiting for a visitor (I can hear knocking through my audio, without forgoing clarity), or even watching the kids. The hf3's are an exemplary model of the Etymotic experience! While Etymotic, and their varied models, offers a sea of research and audio distribution graphs to tantalize the truly discerning audio consumer- the mc3's are perhaps the best option for the everyday shopper. Their 2 year warranty help justify the initial sticker shock, and the impressive performance will surely have the technology addicted returning for the more advanced models. 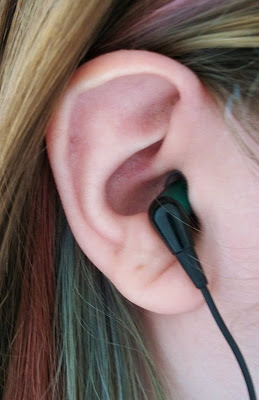 What Daughter Says: Don't compromise your hearing for clarity. Listen the safe, and precise, way with Etymotic! One Momma Told Me follower will win a pair of Etymotic HF3's! 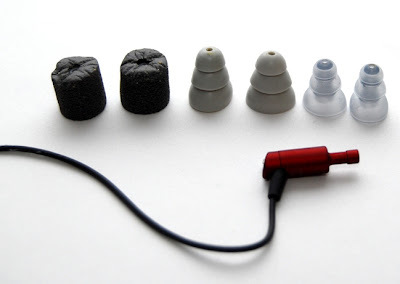 The ETY earplugs might come in handy for those nights when hubby and the dogs are all snoring! I would like the Kids Headphones. Find your button on my right sidebar. Click HERE. I'd also love the Kids5 Headphones! I would like to try the etyblu2 headset also. It'd be fun to have the noise dosimeter. I would love to try any of their headsets... I have to wear one all day at work and I feel like I am always searching for a comfortable pair. The hf2's look really awesome! ETY Kids ear phones would be perfect for my daughter. I'd like to try the high definition ear plugs. Visit Etymotic and leave a comment on the post sharing what else you'd love to try! I need the noise canceling headphones. My husband snores a lot. ETY earplugs are great! I just received a free giveaway - an organic hibiscus tea. Amazingly delicious! :) Wish I could have more freebies in the future! The Musician's Earplugs would be great for our Son who is in a band (he plays guitar). I'd like to try the ER•4 MicroPro™ Series. 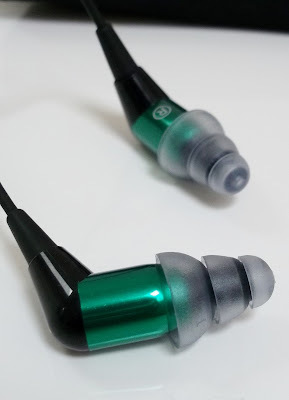 I would love to also try the hf5 earphones! I think the ER-4 Micro Pro buds look really great! They have a braided cord for durability! Awesome for running! i would love to try the high fidelity earplugs. i have issues going to concerts and whatnot with my friends because the loud noises trigger severe headaches and migraines. I would like to try the Ety-Blu 2 Headset and/or the ETY•COM™ headset. I know my Honey/Hubby would LOVE the fabulous prize! i really love this headphone ETYMOTIC head best wireless earbudsphone is comes with noise isolation features..cool for kids.